There appears to be huge over-application of nutrients to crops in China via a combination of both livestock manures and inorganic fertiliser. This over-application manifests itself in increased risks of eutrophication of surface water bodies and emissions of harmful gases to the atmosphere (mainly ammonia and nitrous oxide). Little or no account seems to be made of nutrients in livestock manures in nutrient planning in Chinese farms. There has been considerable research in UK on the availability and value of nutrients (N, P, K) in livestock manures and the principles applied can be utilised in China. In addition to the direct use of manures and other organic co-products such as anaerobic digestate, there is much interest in China in the development of organic fertilizers through composting procedures. This can add financial value to the material but the nutrient content and availability still needs to be assessed if knowledge-based advice is to be given to farmers. This project will assess to what extent the nutrients in livestock manure, composted manure and anaerobic digestate are taken account of when applied to soil in selected provinces in China when planning nutrient supply to a range of crops. It will collate the information available to assist farmers in managing the nutrients in these organic resources effectively. Importantly, the project will explore the major barriers to utilising the nutrients in these organic resources in an integrated way with inorganic fertilisers. We will recommend future investment to reduce these barriers and maximise use of nutrients in these organic resources, thus reducing reliance on inorganic fertiliser use. ・ Review current surveys and literature on livestock manure, composted manure, anaerobic digestate management practices in China: to include information on manure and nutrient production values for different livestock, livestock manure, composted manure, digestate storage times and conditions, applications to different crops (timings and rates), nutrient content, nutrient availability. This information will be collated as best as possible at the national scale. However, detailed farmer surveys will carried out in three provinces; Shaanxii, Beijing area and Jiangsu, to assess manure management in areas with contrasting manure management practices. ・ Review current advice provided to farmers about livestock manure, composted manure, anaerobic digestate nutrient utilisation: to include advice on how, when and where to apply these organic resources as sources of nutrients, advice about integration of their nutrients with inorganic fertilisers. ・ Scope trends in livestock production and effects on manure management for the future: to include the trend towards larger, intensive farms. ・ Explore barriers to utilising nutrients in livestock manure, composted manures, anaerobic digestate in an integrated approach with inorganic fertilisers: to include practical, economic, knowledge and attitudinal barriers. This will require interactions with farmers, extension officers and researchers and use of farmer surveys in the three provinces described above. ・ Identify knowledge and communication gaps and produce a prioritised list of future research and extension needs. Where appropriate, the same information from the UK will be collated and comparisons used to explore what lessons can learnt between the two countries in the management of these organic resources and communication of information to the land user. The ultimate benefit will be determining the potential for China to reduce its reliance on inorganic fertilisers through improved utilisation of nutrients in organic resources and hence reduce the environmental consequences e.g. eutrophication of surface waters and reducing greenhouse gas emissions associated with manufacturing and following spreading of N fertilisers. 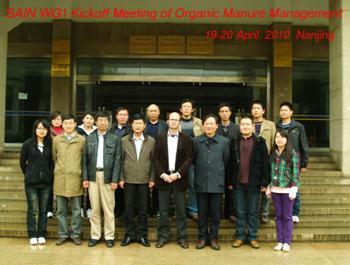 The inaugural meeting of the SAIN Manures Review Project took place at the Nanjing Agricultural University on the 19-20th April. Researchers (and MSc and PhD students) of the four collaborating organisations; North Wyke Research (UK), Nanjing Agricultural University, The Northwest A & F University and The China Agriculture University discussed the project plans and visited a number of manure processing composting plants in the province of Jiangsu.